Welcome to Issue 12 of SHAPE Journal. 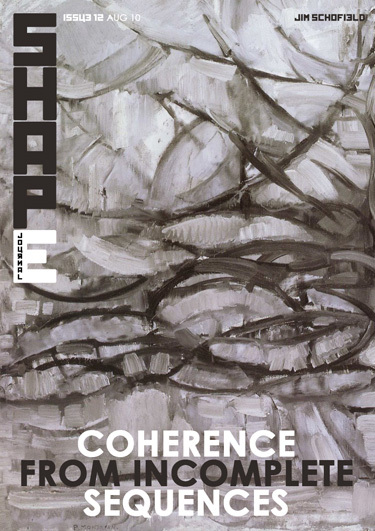 The new paper in this issue is entitled Coherence from Incomplete Sequences, and delivers one important aspect of how scientists can extract reliable inferences and even coherent explanations from what at first seems to be wholly inadequate information. Our chosen exemplar of these techniques was developed some time ago for use with dichotomous trees, but it turns out to be only a part of a much wider range of methods that are often the most powerful means of revealing why things are the way that they are. Of course, there is a limit to such methods. If altogether too little is available, then what is developed from it is closer to speculation than reliable and legitimate construction, so to understand why such methods actually work is vital to their appropriate and effective use. What is always involved in such methods is a great deal of thinking, which is the opposite of what is first done with newly extracted experimental data, where the primary purpose must be to fit-up such information with an abstract formula (from the mathematicians extensive range) in order to be able to predict future performances. But whereas the latter processes are always predicated upon rigidly constrained Domains of Applicability, interpretation and explanations are not so straight-jacketed, and can vault-over many gaps in equation-only based support. The thinking methods of making sense of incomplete information are the epitome of Theoretical Science, and of necessity correlate all sorts of information that would never be included in any purely maths-led process, and though the example included here is perhaps at the simplest end of the actual spectrum of cases, it does begin the process of revelation which will be considerably extended in future contributions. The subject of that paper is on Scientific Writing and is meant to persuade those who have strong positions on the sort of areas that our Journal addresses to submit them to SHAPE for publication. Read and enjoy, and if moved to do so, react! Send us your views for publication in the Journal. We look forward to such reactions as they inform us of what our readers require. Left to ourselves we will not necessarily produce from our prodigious store of work in the best possible order.